This time I am going to review one of my fav eye liner from Colorbar. I love blues and green for my eyeliners. I have 3 from Colorbar, same range. One – Flirty Turq has already been reviewed here. Colorbar is a brand which every girl loves. Its products are so affordable and that too with a great quality. As you all know I am so fond of colored liners and shadows and love to try on new colors on my eyes. These days I am in love with Colorbar I-Glide eye pencils. This range of I-Glide pencils is available in 13 adorable colors. Today I am going to review Colorbar I-Glide Eye Pencil in Electra. – Extremely soft and outstanding smooth formula, almost like a liquid liner. – Easy to blend shortly after application. – Waterproof, super longwear, no transfer and smudge-proof. Defines like a pencil and glides like liquid eyeliner. This effortlessly easy to use I-Glide Eye Pencil with its smooth formulation, gives your eyes rich colour in a single stroke and blends in easily after application. Lasts longer than 8 hours; does not feather or bleed. Close one eye. Place the tip of the pencil at upper-inner corner of your eyelid. Moving the pencil outwards, draw a line as close to the lash line as possible and trace the lashline. Keep it thick or thin depending on the look you want to achieve. These eye pencils come in a silver box and shades are printed on one side of the box. The base color of pencil is silver and tight cap makes it more travel friendly. Overall its really practical and perfect. The texture of this eye liner is quite smooth, almost like a gel liner as the company claims. And for a smudged look, you can easily smudge it just after the application. Its the first liner which really satisfies all its claims. My experience has been very good with Flirty Turq too. Isodddecane, Cyclopentasiloaxane, Peg/Peg-19/19 Dimethicone,Synthetic wax, Hydrogentated Polydicylopentadiene, Nylon-12, C20-40 Alchols , Perfluurononyl Dimethicone, Polyglyceryl-4 Dlosostearate/Polyhydroxystearate/Sebacate, Polythylene, Pentaerytrityl Tetra-D-I-T-Buytyl Hydroxyhdrocinnmate, Tocopherol. I got this one with lots of expectations and this one really fulfilled all. The quality of pencil is excellent and it gives such a good color in single swipe. And the shade is so perfect that it will suit each and every girl, no matter what complexion she has. It blends so easily and gives a rich blue color, very pigmented indeed. The texture is creamy but it doesn’t smudge. I have super oily eyelids and it easily stays for upto 5 hrs on my oily eyelids, that too in summers. In winters, the staying power is much longer. I found it easy to sharp not like other pencils which keep on breaking while sharpening. You can easily get it online at Colorbar Cosmetics Website. Super soft and smooth creamy texture. Rich blue shade in single swipe. No smudging and is waterproof. No irritation or burning sensation to eyes. Hard to apply a thin line. Little expensive but pros are more. Looks Wow Charu..I have prunella from the same range..but this blue is gorgeous! Your make up is stunning! I love the color! Pretty colour! I love it! Omg such a stunning colour and you have beautiful eyes. I am gonna check this one out at the counter. That is such a stunning vibrant shade, I would love to use it on the lower lash line for a pop of colour. Gorgeous colour! Thanks for sharing….fab review. Wow! that blue looks so beautiful! 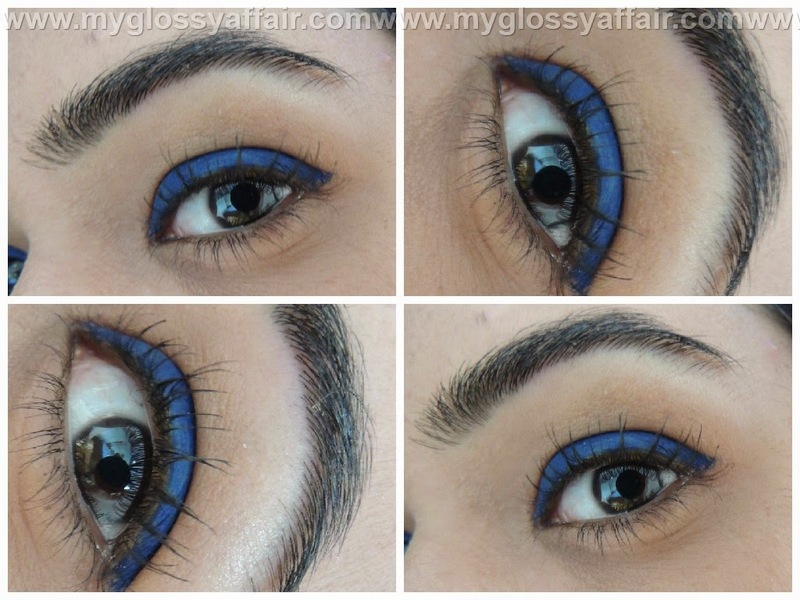 I really love all shades of blue and this looks really good around eyes! must try, thank you for tip! nice pictures, I think if we continue down gfc kisses ??? Charu, I really like this color of blue… I rarely put liner on my top lid as I have trouble applying it there… this liner looks amazing on your top lid. that is such a pretty color. Wow! the color looks so bright and beautiful in the sunlight! The texture, and color on this liner is amazing. Looks so goog on you! Good to hear it's long lasting too. Wow, that truly seems like a gorgeous product! So pigmented and such a beautiful color, thank you for sharing! Your make up is stunning! I love the blue color! Lovely colour! Great review Miss! great colour! with the colour of your eyes is perfect! I love blue liner against brown eyes, it really brings out the warmth! Great review. I have one shade from this range..charcoal shade I guess. I like these pencils..lovely review & EOTD sweety. Looks mat and very rich color. Highly pigmented, I like it.